Your kitchen is a main focal point in your house so when you're considering kitchen renovations of your Winnipeg Home it must be perfect. Wayne and his team at Harwood are no strangers to perfection. They've won multiple local and national awards for kitchen renovations over the years – Kitchen renovations that transformed the space into a beautiful and functional environment where friends and family gather for good food and great memories. 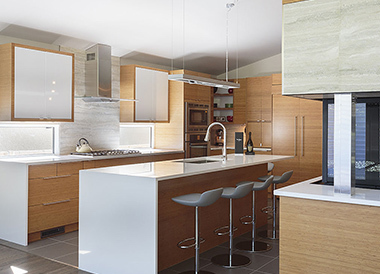 The Harwood approach to designing and producing award winning kitchen renovations is not unlike their approach to any new construction or renovations project and follows their very simple four step process. There are many smaller steps in between of course, but these four steps are at the core. View our gallery to see some of our award winning kitchen renovations. "Having decided to renovate our kitchen, working with someone who could make our dream a reality was paramount in the process. We were very comfortable with Wayne Sage of Harwood Design Builders when we met to discuss the project. extending the dropped ceiling (necessary to clad the second beam) across the entire length of that side of the room, creating a clean visual line for our back hall closet we needed maximum storage (wife's needs) and access to the basement for large items (husband's needs). Harwood's carpenter suggested angling the corner of the closet. A GREAT idea that satisfied BOTH our needs! These suggestions and adaptations took a great construction plan and made it special! During construction, many of our existing windows, once exposed, revealed wet and rotten wood beneath them. Rather than deferring us to next year, Harwood was able to expertly repair the damage and re-side the entire house immediately. They also suggested cladding the existing brick mold with metal, eliminating the need to scrape and repaint every few years. What a GREAT idea! Harwood's construction and carpentry staff have an outstanding work ethic and attention to detail. Through the entire process, we felt they put the same level of care into our home as they would into their own. Their skills are very solid, and so is the construction of our kitchen addition. We can honestly say that Harwood Design Builders gave us a kitchen renovation that exceeded our lofty dreams!"